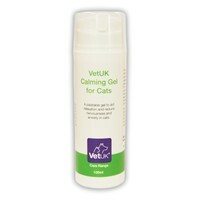 VetUK Calming Gel for Cats is an easy to use, fast acting supplement to aid relaxation, and reduce nervousness and anxiety in cats. Given a palatable flavour to make it more desirable, the gel is perfect for situations such as separation, hospitalisation, transportation, or events such as thunderstorms and celebrations. Cats >4kg: 2 pumps daily. Use half this amount for long term behavioural management. Apply to back of paw or onto food.